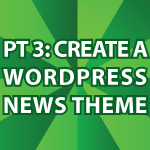 Here I finish all of the HTML and CSS for the WordPress News Theme. Here is all of the code and images from the tutorial zipped archive. It’s licensed under the GNU License, so you can do whatever you want with it. I’m really proud of this tutorial series because I’ve received many emails crediting this tutorial with getting them a job. If you haven’t seen my first WordPress Theme Video Tutorial, check it out first. If you like this tutorial click here [googleplusone] so that more people can find it. In the next tutorials I will convert my Featured Content Slider into a WordPress Plugin. I’ll then move on to turn this into a WordPress theme. After I finish this I’m going to create at least 2 additional themes. I currently have a WordPress Shopping Cart theme planned. I also will create a real estate theme. If you’d like to see something specific leave a comment below.